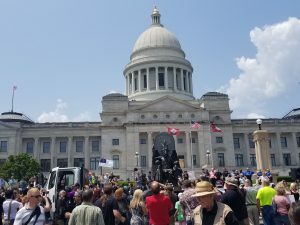 In what can best be described as a circus, the Satanic Temple held a protest rally on the steps of the Arkansas Capitol Building yesterday. The Satanic Temple held the event to protest Arkansas’ monument of the Ten Commandments unveiled earlier this year; the monument celebrates the impact and legacy of the Ten Commandments in American law. In protest, the group parked a flatbed trailer holding a 7½-foot statue of baphomet — a satanic figure — in front of the Capitol Building. Protesters cheered and shouted expletives as the statue was unveiled. The group had originally threatened to put the monument on the Capitol grounds, but nothing ever came of the threat, because monuments require legislative approval. Altogether, we estimate there were somewhere around 100 participants in the satanic rally. An additional 100 – 200 people were also present on the Capitol lawn as part of various counter-protests or as onlookers. Frankly, there just shouldn’t be anything controversial about honoring the significance of the Ten Commandments. As we’ve said many times, the Ten Commandments are one of the earliest examples of the rule of law in human history, and they have had a tremendous impact on western civilization. The Magna Carta, the Declaration of Independence, the Constitution, and the Bill of Rights are amazing documents, but the Ten Commandments are the great-great-granddaddy of them all.